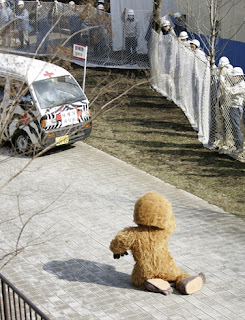 In the photo above, a zoo in Tokyo practices for an escaped animal emergency by dressing one of its workers in an orangutan suit and shooting him with a tranquilizer dart. On the subject of zoo escapes, here's a short article about one of the most famous hoaxes in New York history. In 1874, the New York Herald reported that lions, rhinoceroses, and other dangerous beasts had escaped from the Central Park Zoo and were on the loose in Manhattan. Citizens fled for their lives or took up arms to protect their homes. Of course, few people bothered to finish the article, which stated quite clearly at the bottom that the entire story had been a fabrication. Goodness gracious me! Poor dude! It must 100 degrees in that costume! are any of my comments getting through? There may be a brief delay from time to time. But your comments will always get thru. Sure, sounds cool. Is it going to be blog?